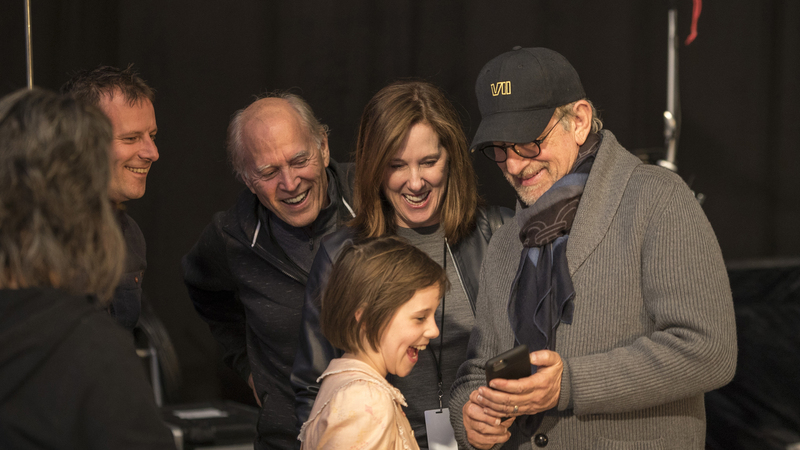 Director Steven Spielberg with Ruby Barnhill and producers Frank Marshall and Kathleen Kennedy on the set of Disney’s fantasy-adventure, THE BFG, . ©Storyteller Distribution Co, LLC. CR: Doane Gregory. HOLLYWOOD—After years of working with various Hollywood movie studios, acclaimed director Steven Spielberg (ET, the Extra-terrestrial, Saving Private Ryan) finally links up Disney to create a fantasy family movie “The BFG.” The story is based on Roald Dahl’s 1982 novel of the same name. The story centers on a young orphan (played by newcomer Ruby Barnhill) who is kidnapped by a giant one night. It turns out Big Friendly Giant (Academy Award winner Mark Rylance animated with motion-capture technology) lives up to his name. He brings her to his home, feeds her and gives her a change of clothes before showing her his collection of dreams. He also protects her from the other giants who want to eat her. For Spielberg, the release of the film is bittersweet. Melissa Mathison, who had written E.T., adapted Dahl’s book, but sadly died last year. There is an acknowledgement in the credits: For Our Melissa. Spielberg returns to the family-friendly fantasy genre after several years of making mostly dramas geared for adults. He spoke at a tony Hollywood hotel about his new film, and the day his father turned up on set. Q: It looked like “BFG” was a lot of fun to make. Spielberg: It was. We could not have made the movie the way you saw the film even five years ago. Not even five years ago. We wouldn’t have been able to get a virtual performance, where you actually can feel the emotion from the character five years ago. Things have really evolved to a point where I really believe, and it’s not just, everybody says, “Oh, it’s the eyes.” It’s not the eyes. It’s not the eyes. It’s every single part of the emotional contours of bodily expression, of facial expression, of the vocalizations. Capturing Mark and trying to preserve the magic that he gave Ruby and us every day when they were actually performing their roles, transposing that on to an animated character, could not have been possible in this way five years ago. We would have only been able to capture 50 percent of what Mark was giving us. Now we have I think 95 percent of what Mark gave us. Q: How about finding your 10-year-old star? How did you find this youngster who just seems so comfortable on screen? Spielberg: When I first met Ruby the first thing I realized was she’s comfortable in her own skin. Very. She’s very confident and she has a tremendous heart. She puts so much love and she puts so much interest out there into the world. She was more interested in asking questions than answering my questions. It was her questions that scooped my questions. We interviewed 300-400 girls in every English-speaking country in the world. We found Ruby at the very, very end of the casting process. (Casting director) Nina Gold found Ruby in Manchester, England. Ruby came in and did a reading and I had seen many, many young girls between the ages of 8 and 11, sometimes 12. We went as old as 12, just in our search. I was shooting “Bridge of Spies” and I was in Berlin when I saw Ruby’s test. I suddenly forgot I was making “Bridge of Spies” and even forgot that Mark Rylance, who was in “Bridge of Spies” and who was already cast as the BFG, I totally forgot that. All I focused on was, “Can you fly her to Berlin, like tomorrow? I need to meet this young actress.” She came out with her dad, who I also put in the movie because her dad’s a wonderful actor. I didn’t even know that until I met him. Her dad was the one that ushered BFG into the Queen’s corridor, going down the corridor, using nautical terms like “full stop,” “hard to port,” “watch out,” “priceless antiques.” That’s her dad. I was very lucky to meet Ruby. Q: There seems to be a synergy here that the book came out in ’82 and “E.T.” came out in ’82 and these are very similar themes of young people and interesting creatures. Is the audience different from that ’82 audience now, or is the way you make films any different from that time? Spielberg: I think the films are a lot different from the way I was making films, because I’m a lot different than I was in 1982. The one thing that doesn’t change is when I can find a good story and the story tells me what it needs, as opposed to me overruling all the values of the story to somehow impose a kind of 69-year-old maturity on to a piece that needed more of a kid than an adult. 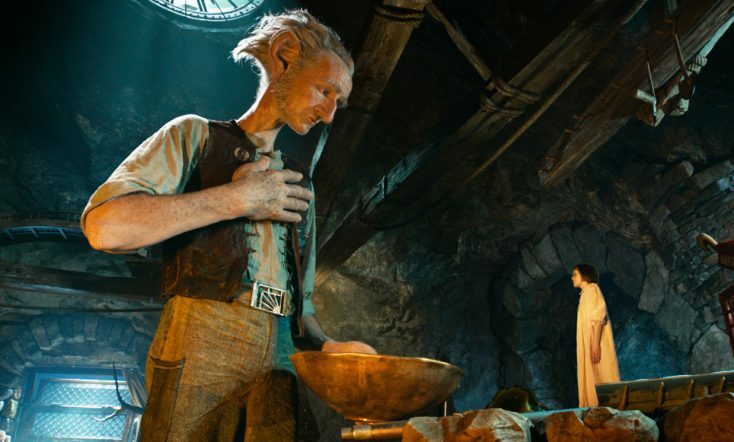 I really feel that I’ve always, a book like “The BFG” or any other movie I see that has young values can just bring the memories of what it was like being a kid right back to me in a flash, like it can anybody sitting around the table. You can get your childhood back in a millisecond. I don’t compare this movie to “E.T.” The only real valid comparison for me is that Melissa Mathison, who wrote “E.T.”, also adapted “The BFG” and wrote this. There are a lot of opposites about “The BFG” and “E.T.,” especially in scale. All the kids were E.T.’s giants. There are a lot of interesting opposites, but I don’t make the same comparisons that a lot of the people who were very favorably comparing it to “E.T.” coming out of Cannes made. When I started reading the stuff coming out of Cannes I didn’t agree with it 100 percent that they’re similar stories, but people are free to interpret any way they wish. Q: To take this book to the screen of course you had to change it and you had to add. Can you talk about how you tried to change it? Spielberg: What the book didn’t have, which I need to tell a story, was plot. The book was experiential. The book certainly gave us every single clue as to how to make a movie about a relationship between a little girl and a giant, and how to make the little girl taller than the giant by the end of the story. That was Roald Dahl’s gift in the story he wrote for his own children. I felt that between Ruby and Mark and I, in trying to capture something that had relevance today, that had value today. It’s one of the reasons I wanted to make this movie. I had been working on a lot of films and I’ve been developing a lot of films that were very reflective of the cynicism of today. The way young people think, especially. I couldn’t find a cynical bone in the body of the screenplay Melissa wrote. One of the things for me that was such a magical excursion into this fantasy fairy tale world is that there’s no cynicism whatsoever, and that was a real relief for me. Q: After a number of historical and more adult dramas, how easy was it for you to get back into that child-like sense of wonder that you needed to have to bring this movie to life? Spielberg: I was so covered in history, this was like taking a shower. It was like taking a really nice, hot shower and I’m just watching all the history go down the drain, at least for the next two movies. Then I get back into history right after “Ready Player One.” I love history. I can’t divest myself of it. I love it. I read too much history. As I’ve gotten older, history becomes much more relevant to me. Q: How much fun is it for you to play in the animated world, and did you have a scene that was your favorite to direct? Spielberg: We got through the whizzpopper. Barely got through it. For one thing, Mark had to be put on wires and he had to be jerked into the air every time he whizzpops. Mark loved it. He had never made a movie like this before, needless to say. He does mainly stage plays. He’s been in some rigs in theater, but he’s never been pulled into the air with an off camera, whizzpopping sound effect before. I think Mark said, hey, if movies are going to be like this every time, I think I’ll make more movies now. He had a great time. It was hard to get him through a day without laughing our heads off, because for one thing you have to understand that Ruby and Mark are working in a big, big, white space called a motion capture volume. The sets are all made of wire. Ruby is on huge sets to be able to reduce her in scale. There’s huge dream jars, and the table is humongous. Mark is on a scissor lift 20 feet above Ruby, looking down, so they can make eye contact. Q: How long ago did Melissa Mathison write this, and was there any rewriting of it at all? Spielberg: Yes. She started the script about 11-12 years ago, after they got the rights from the Dahl family. I became involved in the project three and a half years ago, but Melissa and (producer) Kathy Kennedy had the project in development for about six and a half years before I became involved. Then there was a lot of rewriting once I signed on as the director. Q: There’s a reference to President Ronald Reagan and Nancy Reagan. So this is actually set in the ’80s? Spielberg: Yeah, it was because the book was published in ’82, so we thought that it would be appropriate for the film to be set at the time the book was published, which is why Ron and Nancy make a cameo off-camera in our movie. Q: Could you talk to about the influence and the regard that you have for Walt Disney himself and the way that he paved for you as a filmmaker? Spielberg: Walt Disney more than Alfred Hitchcock or more than anyone else, when I was first becoming aware of suspense and when I was first become aware of the power of cinema. The power to seize you in a choke hold and not let you go, and often when it finally releases you, you come out feeling unredeemed because you’ve been terrified. Disney was the first time I realized you could be scared half to death and then rescued minutes later. Not hours later, minutes later. Disney had this incredible power to create images that were so frightening you had to turn away from the screen, but then suddenly those images would turn in to a beautiful moment of transcendence. It’s a cliche about battling the dragon and it’s terrifying. When you’ve finally vanquished the foe, you’re left with the damsel in distress. Disney of course would take the damsel in distress and turn the damsel into the proactive heroine, so Disney also had strong women in all the animated films. “Cinderella,” “Snow White.” You look at all the animated films, very strong women. I find that Disney probably influenced me in that sense. It also made me feel that it was ok to scare as long as there was light at the end of the little vignettes of darkness. I think in a sense Disney was a big influence maybe even over Roald Dahl in that way, because he wrote a very strong female protagonist in the book. Q: Speaking of big franchises, any idea what it’s going to be like to make an “Indiana Jones” movie without George Lucas’ input? Spielberg: George will be inputting. George is going to be an executive producer on it with me. I would never make an Indiana Jones film without George Lucas. That would be insane. By the way, George Lucas’ fingerprints are on “Star Wars: The Force Awakens,” because that movie is an homage to Episode 4, 5, and 6. A complete homage, so George Lucas is all over “The Force Awakens,” lest we ever forget that. Q: What else is going to be in the new “Indiana Jones” movie? Spielberg: I can’t tell you that now. We’ll be back here sitting around in 2019 talking about it. I’m doing “Ready Player One” next. I start shooting a week from today.